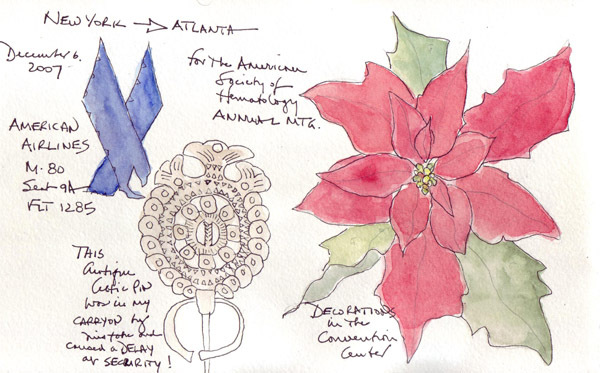 I just returned from 6 days in Atlanta, where I was attending an annual meeting of my medical society. It comes each year at such a horrible time - but the cities I visited during the last 30+ years are all gorgeously decorated for Christmas. 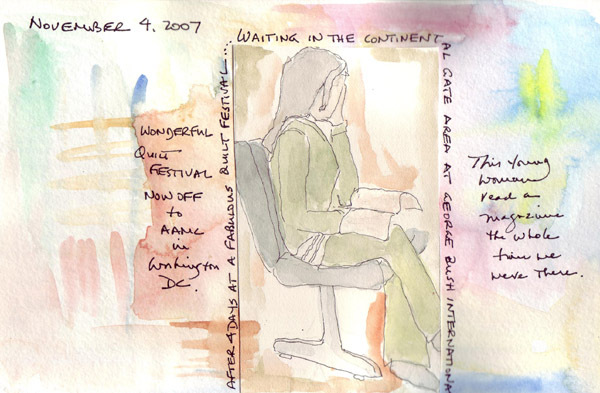 When I arrived last Thursday, I did a sketchwalk (as discussed by Mari Le Glatin Kreis in her recent book) and filled the whole 2 page spread of my Moleskine watercolor journal. From left to right across the two pages: The American Airlines logo from the airplane, the antique Celtic pin complete with a sharp dagger on the bottom which was in my carry-on (by mistake) and picked up by TSA (they let me keep it! ), one of the many Poinsettia plants in all areas of the Georgia World Congress Center, the top of the Westin hotel which was visible from the Congress Center, and a view of the entrance to Olympic Centennial Park as seen from my hotel - the Omni at the CNN Center. On the second day, to get a head start on my Art Goals for 2008, I sketched one of my friends who was giving a 30 minute lecture. 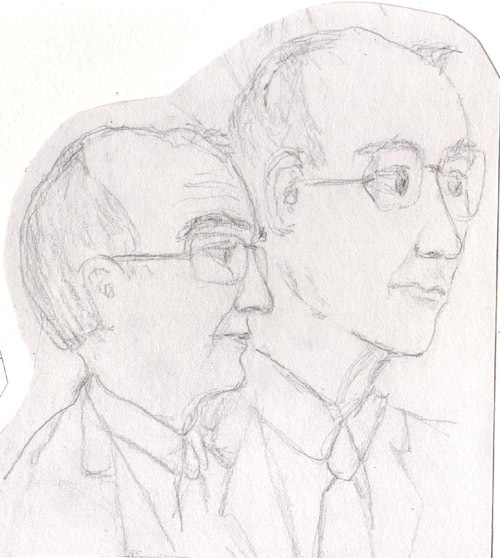 My son, who is also a member of the society, thought there was a likeness, so I was pleased. 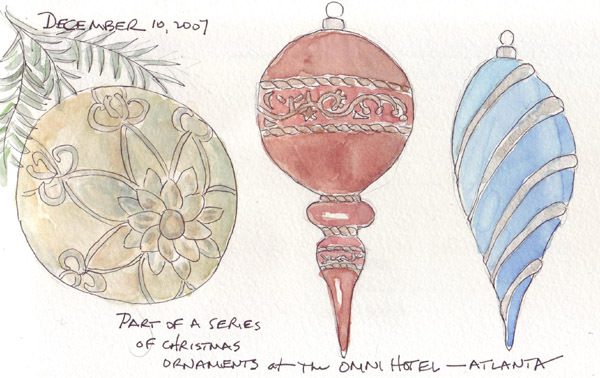 On the final day of the meetings I sat in the Omni Hotel, listened to Christmas music which was playing in the lobby areas, and sketched 3 beautiful Christmas ornaments. The gold and silver gouache doesn't show up in the scans, but the beautiful metallic reflections attracted me to these 3. EDM Challenge #146: My two favorite foods are good bread and ice cream and I could have both for supper and call it a wonderful meal! 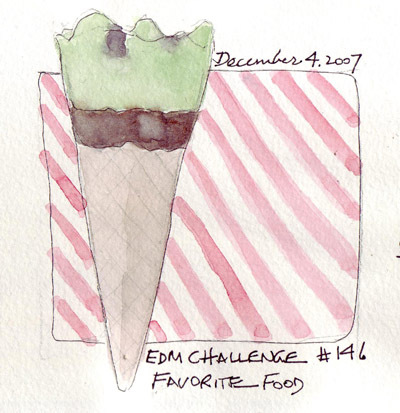 This is a Skinny Cow mint and chocolate fudge ice cream cone that I sketched and painted really quickly before I ate it. 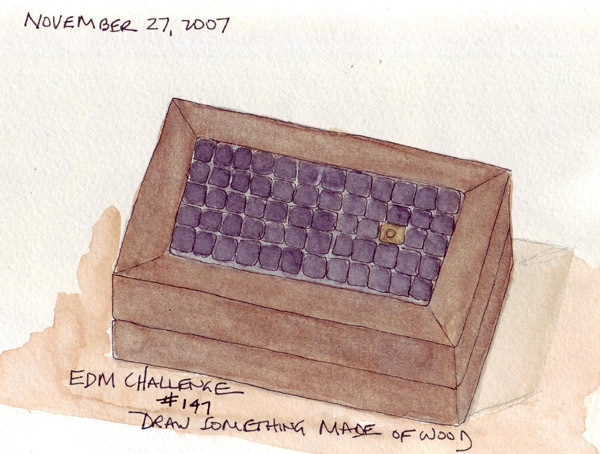 This small wooden box has inlaid black marble squares and one brass square on the top. 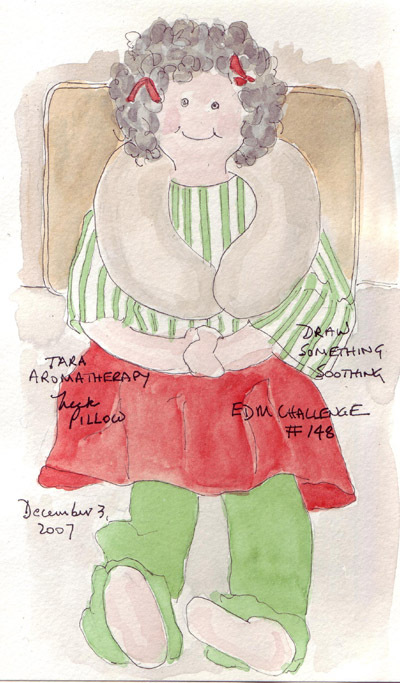 This Christmas Door Doll, that is 20 + years old, is wearing a Tara Aromatherapy Neck Wrap that was given to me by my daughter last weekend as an early Christmas present. It gets heated in the microwave for 2 minutes and then provides at least an hour of moist heat to your neck muscles - relieving all computer strain. 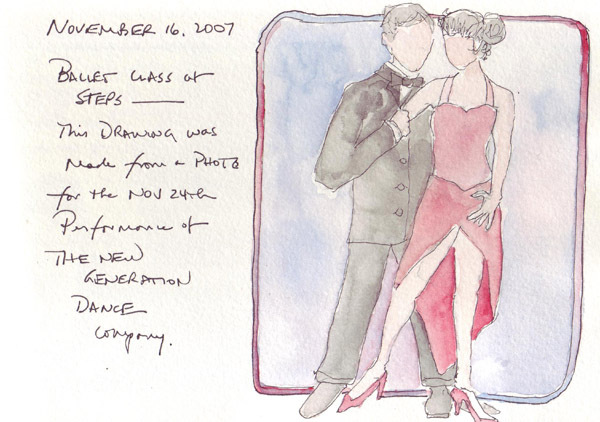 One of my Art Goals for 2007 was to sketch more figures. These are my journal pages for November. 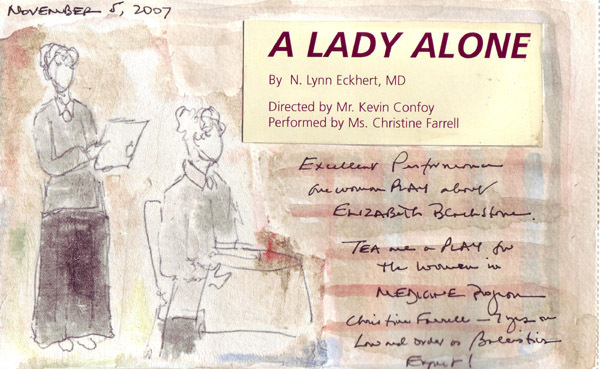 Gesture Drawings: Passenger in airport terminal, an actor in a one woman play about Elizabeth Blackwell, and a ballet class member warming up. 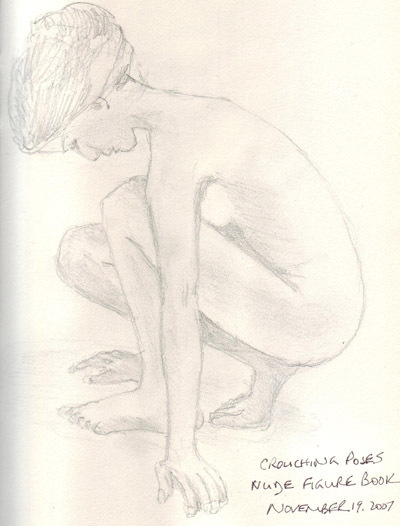 I find it really difficult to sketch almost constantly moving figures! 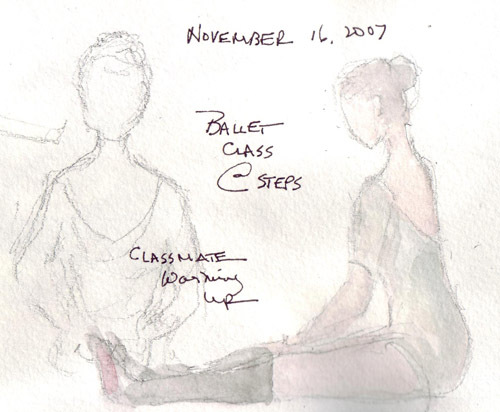 Dancers: Only one dancer sketch from a photo this month - done in the Cafe after ballet class. 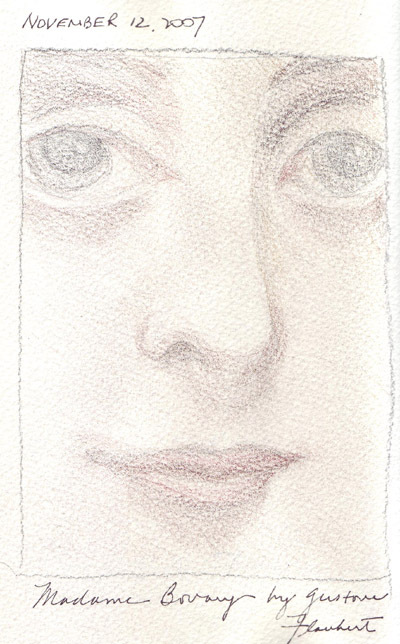 Several Faces as a prelude to ART GOALS 2008: The first is from the front of my edition of Madame Bovary - my Book Groups' November book for discussion. 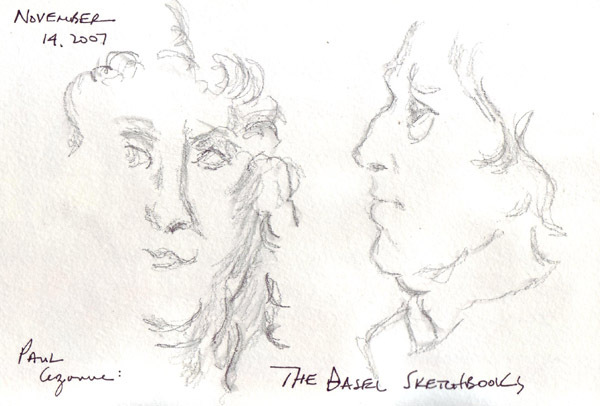 The second are two faces I did from my Cezanne Basel Sketchbooks. While my husband and I were preparing dinner for our 15th Annual NYC Family Thanksgiving holiday, cousins were balloon handlers for the giant Snoopy balloon in the Macy's parade. 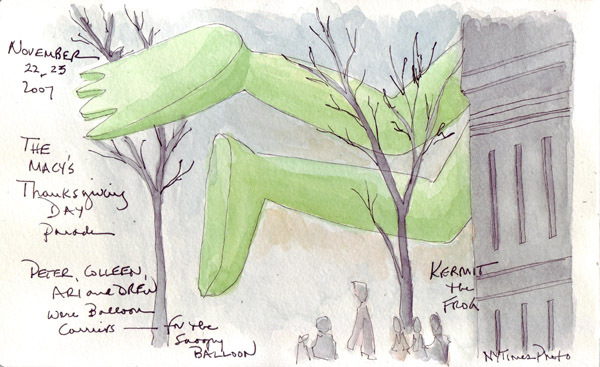 This sketch was taken from a photo on the front page of the New York Times yesterday - showing the Kermit balloon floating down the Avenue. We learned that it is really hard work! 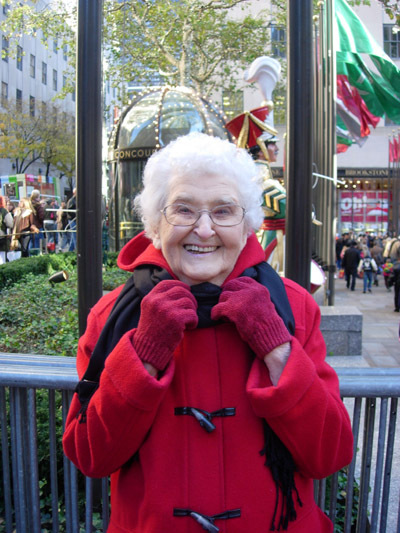 Yesterday my 88 year old mother and I took the 5th Avenue bus down to Rockefeller Center to see the Christmas decorations and the annual tree. Although it won't be lit until Wednesday night, the lights are already on the tree and the entire area around the skating rink is beautifully decorated and full of visitors. 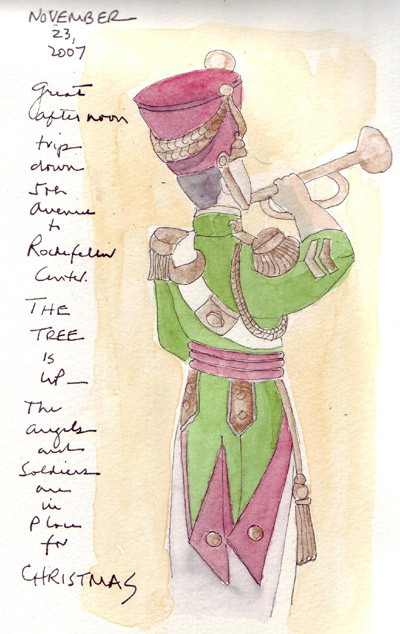 This sketch was made from a photo that I took of one of the 3 soldiers on the north border of the rink. It was really cold and outdoor sketching just wasn't going to happen! I love the Christmas decorations in New York City - and even don't mind the crowds. 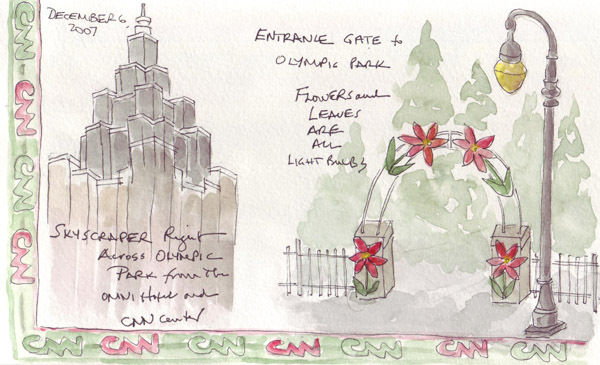 My, mother, who hasn't been in NYC for the holidays for many years, had a wonderful time. She's amazing and kept up beautifully! I'd rather sketch 10 buildings - or many figures in motion rather than sketch and paint a tree. So this was definitely a stretch for me! I love the gold-orange-red trees of autumn so I take many photographs on my walks. This tree was on the sidewalk across the street from my son's house in Capitol Hill in Washington DC. 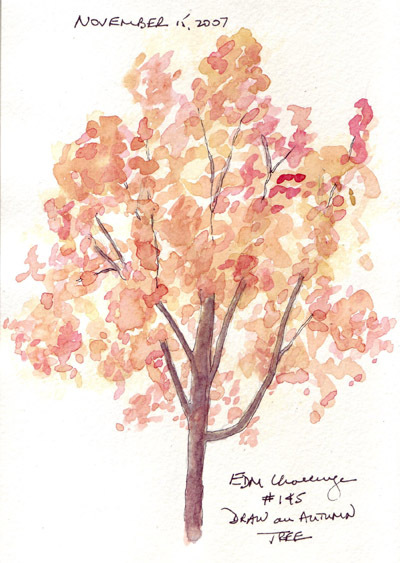 I had no time to sit outside this week and paint, so I was happy to have my recent photo.